We discuss how nonequilibrium driving forces introduced by natural biological activity or by a physical self-propulsion mechanism generically affect the structure, dynamics and phase behavior of dense particle systems. 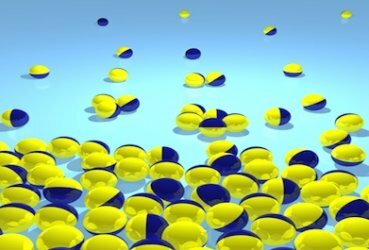 We use theory and computer simulations to analyze simple models of such active materials, and explore connections with experimental studies of more complex self-propelled colloidal systems, biological tissues, or bacterial colonies. Ludovic Berthier received his Ph. D. in theoretical physics in 2001 at the Ecole Normale Supérieure in Lyon, France. He was a Marie Curie Postdoctoral Fellow at the Department of Theoretical Physics at Oxford University until 2003. In 2004 he was appointed as a CNRS researcher at the Laboratoire Charles Coulomb at University of Montpellier 2, France. In 2007, he was a visiting scientist at the James Franck Institute of the University of Chicago, US. He works on the statistical mechanics of disordered materials, nonequilibrium systems, and soft matter.